Episode 2 of the Walking Dead takes place three months after the end of the first episode, and features some really difficult decisions that you’ll have to quickly make. Based on the choices you made in the first episode, ‘Starved For Help’ shows how alliances with different people are starting to be formed based on how you either helped or weakened your position with them. 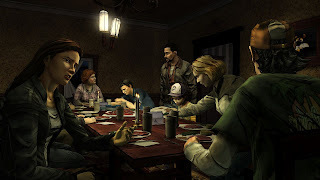 Without giving anything away, you can see how characters like Lilly and Kenny treat Lee, as well as others in the group who look to Lee for backup in decisions. If you thought the first episode had intense moments, you’ll still be surprised about how much crazier things get for these survivors in this episode. There is a bit more action this time, but it’s all very hectic and requires quick responses. You’ll have to make hard choices and really stick by them as you continue on to Episode 3. While the gameplay remains the same, there is a bit more to do and more choices for you the make which will continue on, so replaying this episode one or two times may help if you want to better your status with certain characters. The game’s comic-like visuals are still great, and this episode shows it off more as you traverse many outdoor environments for most of this episode. Voice acting is just as great as for the sounds of walkers and ambient scores. 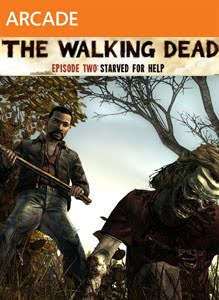 With Episode 2, you’re probably looking at about 2½ hours of more Walking Dead on the first play-through, and with about an hour if you want to replay and see how different elements turn out based on trying out other choices. Arriving a little later than expected, Starved For Help is another great episode for TellTale’s talking on a more mature adventure game, although I wanted a bit more to hold me over until Episode 3. But I guess that’s what a good game does: leaves you wanting more. "Episode two of a five-part series set in Robert Kirkman’s award-winning universe. Three months after the events of episode one, starvation forces the group to seek food from strangers. In a world where the living can be more dangerous than the undead, this is a risky move, but you’ll soon learn how far you’ll go to survive. How will the choices you made in episode one affect your story? Purchase of this DLC requires The Walking Dead - Episode 1: A New Day."